A brand new production of Shakespeare’s masterpiece, the wonderful The Tempest to be directed by John Timewell. The play will be staged over one week from 18th – 22nd June 2019 at Stubbings. 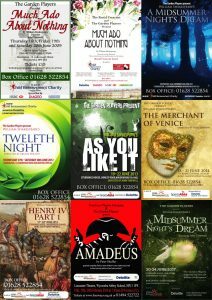 The Garden Players are an amateur acting company formed in late 2008 who perform Shakespeare’s plays in open air garden settings to support selected charities, including Child Bereavement UK and SportsAble. We have also previously supported local Rotary causes and Children with Leukemia. The company was initially comprised of experienced performers drawn from local societies within the Thames Valley area. We have an exciting programme of events lined up and would be delighted to hear from anyone interested in joining us either on stage or in a variety of other important areas. The origins of The Garden Players can be traced back to the production of a Variety show at the Beacon Centre, Beaconsfield in February 2005 in support of Cancer Research and Thames Valley Hospice. Most of those taking part subsequently became involved with the Shakespeare productions which commenced in 2009. The total raised for charities from all productions, including the Variety show, is in excess of £100k and so a key target has now been achieved.